This article was written by our shiny new contributor Brendan Mackie. François-Marie Arouet knew how to get into trouble. After a very public scuffle with a nobleman nearly ended in a duel, the young playwright was exiled from Paris, the city where his plays were only just coming into fashion. He lived in dreary England for two whole years before slinking back to France, where he lived in the house of a pharmacist. There he experimented with various potions and poultices, but nothing would cure the vague sense of impotence and dread that dogged him. Finally in 1729 the gates of Paris were opened to Arouet again, but he was still ill-at-ease. At a dinner party held by the chemist Charles du Fay, Arouet, better known by his pen-name Voltaire, found the cure he had been looking for. He met a brilliant mathematician called Charles Marie De La Condamine, who promised a panacea better than any Voltaire had found at his pharmacist. It wasn’t medicine—it was money. 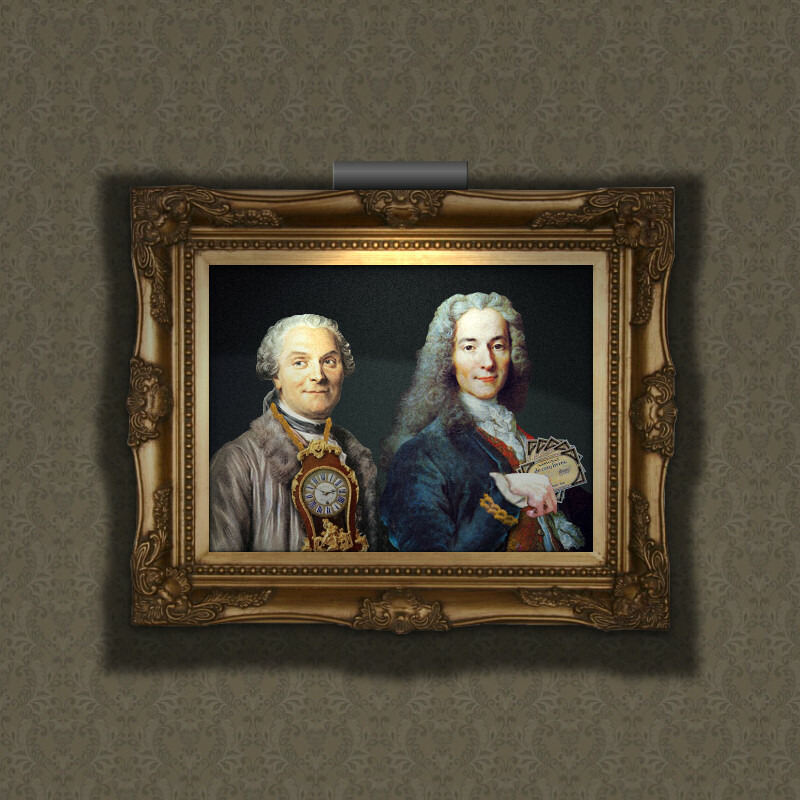 Condamine had a plan that would make both him and Voltaire more money than he could ever scratch together by writing plays or poems, enough money to allow Voltaire to never have to worry about money again. He would be free to live how he wanted and write what he wanted. The plan was simple. Condamine planned to outsmart luck herself. He was going to arrange to win the lottery. At the time the French crown secured much of its revenue by issuing government bonds. In 1727, in order to save money, the state cut the bonds’ interest rate. The market value of these bonds plummeted, and the market became wary of French credit. The French state was left without an easy way of raising money. A Deputy Finance Minister named Le Pelletier-Desforts had a great idea that would let the state drive up the prices of the bad bonds and so restore faith in the government’s finances. In his scheme owners of bad bonds could buy a lottery ticket. If your ticket won, you would win back the face value of your original bond—plus an extra jackpot of 500,000 livres. This was a lot of money. While no comparison to modern-day currency is possible, an annual income of only 30,000 livres would make a person very, very rich. 500,000 livres was enough to make a person rich for the rest of their lives. French citizens were allowed to buy a ticket for every bond they owned at 1/1000th of the bond’s value. A ticket for a 1,000 livre bond cost one livre, while a ticket for a 10,000 livre bond cost ten livres. But both tickets had equal chances of winning the 500,000 livre jackpot. Condamine realized that a group of people could buy up a lot of cut-price bonds, split them into tiny parcels of 1,000 livres, buy up cheap lottery tickets, and thus easily win the huge jackpot. Voltaire and Condamine started a syndicate to do just that. But once they got the people, the money and the bonds together, they faced a final problem. Lottery tickets were issued only from a very small number of notaries, and the notary issuing stacks of lottery tickets to shifty young Voltaire would almost certainly guess what was going on, and give the syndicate away before any money could be won. Voltaire had to develop an ‘understanding’ with a notary before the plan could proceed. Once this was done, the young men were ready to get rich. Every month Voltaire would go to the Châtelet to visit his notary, and walk away with reams of tickets. By tradition people inscribed the backs of their tickets with good-luck phrases. Voltaire’s were mocking. “Here’s to the good idea of M.L.C. [Marie De La Condamine]!” “Long live M. Pelletier-Desforts!” He signed them with a series of assumed names, getting increasingly more absurd as the scheme went on. Every month on the 8th when the tickets were drawn, the syndicate would be about a million livres richer, according to Voltaire’s later estimate. The authorities noticed that the names on the backs of the winning tickets were suspiciously similar and this led Le Pelletier-Desforts to discover the syndicate. The Deputy Finance Minister brought the syndicate to court, but in the meantime every 8th of the month the lottery was drawn again, making the syndicate just a little bit richer. Eventually, the royal council ruled in the syndicate’s favor, letting them keep their absurd riches, though the lottery was shut down. France surrendered, and Le Pelletier-Desforts lost his job. Voltaire himself probably won around half a million livres—a large fortune, which he then made even larger in a series of canny investments. Soon Voltaire was a very rich man, rich enough to become a moneylender to the powerful and famous, rich enough that he no longer had to stake his financial well-being on that most unreliable and detestable profession—writing. Charles Marie De La Condamine used his winnings to good effect as well. Three years after the bonanza he travelled to Ecuador as part of an expedition to discover the true shape of the earth, proving that the earth is not a perfect sphere but is instead squished a little bit around the poles. He became the first scientist ever to travel down the Amazon river, advocated smallpox inoculation back in France, brought rubber to Europe, and helped define how long a meter is—as well as finding time to publish numerous popular books and to promote the use of quinine as a cure for malaria, thus easing the suffering of millions of malaria-infected people for hundreds of years and providing the tonic water for our gin and tonics. Voltaire spent the rest of his life causing trouble. He befriended King Frederick the Great, wrote one of the first science-fiction stories in history called Micromegas, had an argument with King Frederick the Great, was arrested, fled to Paris, was banned from Paris, and so settled in Geneva where he spent time entertaining the most interesting minds of the time, including Casanova, Adam Smith and Edward Gibbon. He wrote articles highly critical of Christian dogma when impiety could get a man killed, and championed human rights before there was even a word for human rights, and the whole time he did this he kept Europe entertained. On his deathbed, one story goes, a priest asked him if he would renounce Satan and all his works. “Now is not the time for making any new enemies,” Voltaire quipped. But life would have been very different for Voltaire if he had not been rich. Without a fortune, Voltaire would have been forced to court the good favor of princes and kings, instead of infuriating them. Without a fortune, Voltaire would have had to write for the public, relying on book royalties and theater receipts, instead of writing what he really thought. If he wasn’t rich, Voltaire may not have been so brave, and if he hadn’t been brave, he would not have been Voltaire. Today Voltaire stands in the popular imagination as something like a one-man Enlightenment. His book Candide is one of the most-studied books in all French literature. But he only reached the heights of literature because he dared to challenge luck itself. Written by Brendan Mackie, copyright © 14 August 2012. Brendan works in market research in the ancient metropolis of Chicago. In his spare time, he looks at the books on his bookshelf, and feels pleased. He also blogs about interesting facts--infrequently--at bmackie.blogspot.com. Edited by Alan Bellows. Cover art by Alan Bellows. Last updated 21 November 2016. This article was funded by donations from our readers/listeners. I’ve been a fan of Voltaire since hearing about him in a European history class, but I had never heard of this brilliant scheme before. Great article; looking forward to reading more from you! And knew the weaknesses of man. Thanks, an impressive start with a magnificent write-up and we’re looking forward for more. Welcome Brendan. May you enlighten us with many damn shiny stories.. Thank you B. You and your writing is DI! Thanks for all the thanks, folks! And yet, here you are Brendan. All we need to do now is ensure that Alan keeps you away from all those lotteries. “one of the first science-fiction story in history” => stories ? Is that a picture of Flav-O-Condamine up top, or am I mistaken? People keep referring to this scheme as a brilliant idea. Well it may be intelligently put together but I’m afraid to say that technically it was also illegal and thus fraude. Yeah that’s right, Voltaire was apparently a crook as well as a brilliant writer. Please. let us not place this escapade on his list of achievements as well. I would have thought that coercing the notary to be an accomplice in this plan would have been a crime (for Voltaire AND the notary). I could be wrong though, that’s based off of no research at all. I would also guess that they probably didn’t have as good of a way to “freeze assests” like law enforcement does today. I would imagine that it was a great deal easier to launder money. Not according to the courts. I love that Condamine links this article and the one aaa out the Amazon. @anonimoose: Heh! Brendan and I discovered the two stories involving La Condamine totally independently. Apparently Damn Interestingness followed the man wherever he went. I don’t really like the Calvinist conclusion that money makes you what you are. Voltaire wasn’t the first or only wealthy man on Earth and yet he spoke his mind well ahead of time by expressing concepts that are at the foundation of our human rights today. One could even argue that there were already signs of his free mind before the lottery scheme came into being and that he would eventually become Voltaire anyway, but that again would be interspersing history with our beliefs. Voltaire did not need to be rich. He needed only a reliable job and the passion to write. Thus explaining why English majors seldom publish great works.